It's raining again. Aren't you a little tired of the gray? Me and the kids made our own color today at dinner. 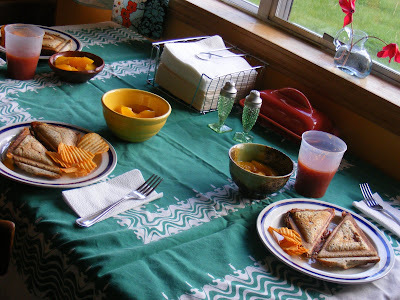 Soup and hot sandwiches with peaches. Hi.. I might be asking a very stupid question, but.. are you eating crisps with tosti's? I've never seen such a combination.